Less common than their traditional counterpart, box-pressed cigars are nevertheless much appreciated by some aficionados. Here’s where they come from and how they are shaped. Four-sided cigars may not be as well known as their cylindrical counterparts, yet they are the favorite of many aficionados. According to advocates, the squared shape of box-pressed cigars beautifully enhances and intensifies tobacco flavors. The packing process involves a gentle application of pressure that condenses the tobacco leaves and results in a cigar with a better draw and a cooler, steadier burn. Some cigar lovers also find that the silhouette is a more comfortable fit for their fingers and mouths. “In my opinion, they go out less often and burn more consistently.” says one enthusiast. Rick Rodriguez, blender ambassador at CAO, a cigar company, asserts that the shape of box-pressed cigars allows the smoker to inhale more air with each drag, which cools down the smoke temperature and helps appreciate the flavors more. Rafael Nodal, owner of Boutique Blends Cigar, states that box-pressed cigars work better with some kind of tobacco blends. These small differences apart, it’s all a matter of aesthetic and personal choice. Not everyone agrees on the origins of box-pressed cigars. Despite that, Cuba is central to the stories, as it is with so many things related to cigars According to Tad Gage, the author of The Complete Idiot’s Guide to Cigars, the practice goes back to the early 20th century. Around that time, cigar manufacturers started packing their cigars really tightly – fitting more cigars in each box meant saving on shipping costs. By necessity, newly rolled cigars are slightly damp and pliable, so if packed snug, they gently adopt a new shape. Other theories hold that this packing technique was born to prevent cigars from rolling around in their boxes during the trip, as they were shipped by boat at this time. Anyway, once out of the box, cigars had a more square shape, which would have appealed to some connoisseurs. Manufacturers would therefore have started to create this kind of cigars on purpose. In his book The Ultimate Cigar Book, Richard Carleton Hacker says that the square shape was only created so that the cigar doesn’t roll and fall off the table between two puffs. 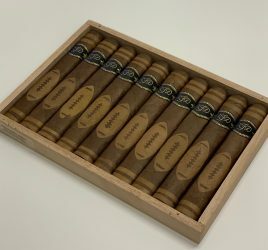 Regardless of their origin, box-pressed cigars are, as you can tell by their name, obtained by tightly packing the freshly rolled cigars in their box. It has to be tight enough for them to adopt the square shape, but should not damage the delicate tobacco leaves that wrap the outside of the cigar.The boxes are then packed on top of one another and placed on a manually controlled press with just enough pressure to tightly seal them. For die-hards, ‘box-pressed’ distinctly applies to round cigars packed tightly into their final box to achieve the squarish shape. Just as the name implies, the pressing takes place inside the cigar box. But some also use the word to describe any square cigar, including those shaped prior to packing (meaning, the pressing outside the cigar box). One of the most famous of these squaring methods is called “trunk pressing”. It involves a wooden press, where the cigars rest up to 12 hours in order for them to adopt the perfect shape. After this period has elapsed, the cigars are turned 180 degrees and placed under pressure again for an equal amount of time. As trunk pressing involves more labor, the consumer is usually charged more, but you can’t put a price on perfection, can you? 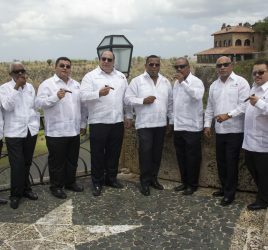 Where to buy box-pressed cigars? 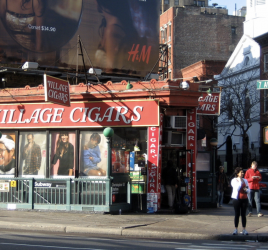 Now that you know everything about box-pressed cigars, where can you get a good one? Box-pressed cigars come in all the same sorts of sizes and shapes as rounded cigars (the full spectrum of figurados and parejos). Romeo y Julieta were among the first prominent cigar makers to produce them and they still offer many options today. Padron produces some excellent ones, such as the Serie 1926 No. 6 Maduro Robusto, which offers flavors of wood, leather, and chocolate. Rocky Patel’s premium box-pressed cigars include the Rocky Patel Vintage 1990 and 1992, Decade, Olde Worlde Reserve, and Honduran Classic. Among the Ecuadorian cigars, you can also check out the La galera 1936 and the Camacho BXP Ecuador. Enjoy!